UPDATE: July 30, 2011 @ 9:45 p.m.
You can now Vote for your favorite designs! The voting period will last until August 7 and winners will be announced on August 18. Good luck to all who entered! Which design do you hope wins? 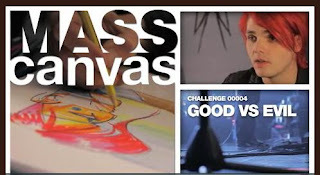 ORIGINAL POST: July 1, 2011 @ 5:48 p.m.
My Chemical Romance alongside MASScanvas, a t-shirt design company that works with artists and charities, have issued a t-shirt design challenge to benefit the Make-A-Wish Foundation. The challenge, should you choose to accept it, is to submit a "Good vs. Evil"-themed design by July 22. MCR vocalist Gerard Way advises designers, "I think what makes a submission better than another is, firstly, the originality and the idea most of all [and] being fearless about it-- doing the really hard stuff, doing the dangerous stuff, doing the stuff that may ruin your chances. Don't always take the safe way out." "Submit your art in any style you feel will meet the challenge," Way says. Five winners, which will be announced by the band on August 18, will receive a $1000 prize (the highest seller will receive an additional $1500). A public vote will decide the top 20 entries, and the band will choose the top 5 from them. Winning designs will be sold on t-shirts through MASScanvas for a limited time, and a portion of all the sales will go to the Make-A-Wish foundation. I am super pumped about this! Graphic Design- more specifically T-shirt design, good vs evil, MCR... its like everything that I love! Thank you! I know a lot of fans are very excited to submit their designs for this! Yay! I'm glad this fits your interests so well! Good luck!